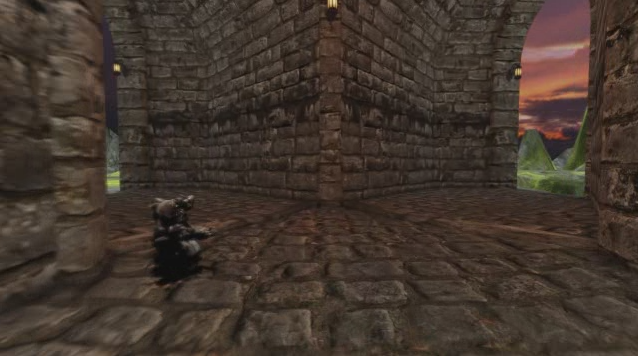 Castle Walk is a technical demo (not a game) that I did using the Unreal Development Kit. The code is done in UnrealScript (the propietary scripting language used for Unreal). I allows a user to walk in a 3D environment that contains a Castle, a lake and some hills. There are also NPC (non-playable characters) that wander around the area following predefined navigation paths. I implemented keyboard shortcuts to access different cameras, viewmodes (textures, lights, wireframe…), and also a “god” mode that allows the player to fly and penetrate all objects. I implemented a basic skybox, different light sources, particle systems (fire, smoke and leaves falling of a tree). I also modelled the terrain myself using UDK’s terrain tools. For the castle mesh I also had to implement the colliding surfaces to avoid that the player and NPCs would be able to penetrate the walls.